Learning to drive in a big town such as Watford will definitely prepare you for life after the test, as all elements of driving can be accessed and taught easily here. In some areas of the town you may feel like you are driving in areas of North London, skills such as anticipation and meeting traffic will be needed to a high level where you can see/feel the hustle and bustle on the roads ahead of you. In other areas of the town you may feel like you in are in the country side where good planning/road position and approach speed to bends will required heading out towards areas like the leafy Chandler's Cross. Pupils who have recently passed with us in Watford. I am really happy with my lessons so far; John has taken the time and consideration to plan out all of my lessons. They also lead on from one another so you can see how much you are progressing! Fantastic teacher- Julie is very relaxed and put my son at ease from the first lesson- She has a really good way with teens and was very flexible and reliable- My son passed first time which was great- Highly recommended! After learning with a different driving school in the past who always let me down, I was so happy when I came across Drivejohnson's. After explaining all the hassle I'd had in the past, the lovely office team booked me in with John, and I couldn't have been more grateful. John is the best instructor I could have asked for and really is amazing at his job! Thoroughly recommend John from driveJohnson's, he is a fantastic instructor! He was great at communicating with me in the lessons and made sure I knew exactly what I was doing every step of the way. Was so happy when I managed to pass in just two weeks with John! I really wanted to pass before I went to uni and John made that happen for me. The lessons were so productive and each was planned beforehand so we didn't waste any time. To anyone looking to pass quick, book your lessons with John! I would like to thank Andy Mitchell for all the support, positivity, patience and calmness that he had with me during my lessons with him. after my previous experience, I never thought I would pass my driving licence, with Andy the experience was amazing, his polite, funny, has good sense of humour, makes you comfortable, respects, and always makes you laugh. my confidence increased in driving and my fear of roundabouts had been greatly improved all thanks to the amazing and wonderful instructor. He never gave up on me and always encouraged me to stay focused and be positive. I am glad and appreciate all the skills I have learned from him.I have definitely recommended him to my friends and families. thank you so much for helping me get through with my driving license . I booked my first ten lessons with John; he is a fantastic driving instructor! I cannot recommend him enough, he is a rigorous teacher and will tell you when you are making a mistake, but this all leads to helping you become a better driver. Started to learn with Andy after years of putting it off. Andy was patient, informative, flexible with booking sessions and most of all came across eager to teach and improve my driving skills. His lessons always seemed worthwhile, hugely enjoyable and enabled me to pass my test 1st time. I thoroughly recommend his service for any considering getting some lessons. John was an excellent driving instructor; from the very beginning, he was extremely patient. Even with the more complex manoeuvres, he would make sure I felt confident in what I was doing and if not would explain in detail. Andy was an excellent instructor, he pinpointed my weaknesses in driving and helped me improve in those areas. 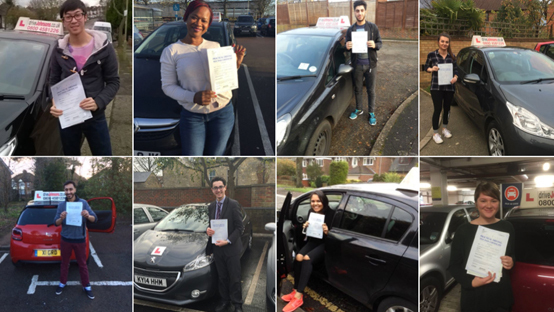 He is a truly fantastic driving instructor as not only does he teach you to pass your test, but also to be a safe and cautious driver. During my learning we covered possible routes and everything I needed to know in order to pass my test. Overall he was a pleasant company to drive with, with a good sense of humour and great patience. Lessons were enjoyable and fun, whilst at the same time being highly productive and efficient. I had an amazing experience with my driving instructor John, he was so good at teaching and made sure I was completely test ready before telling me to book in. I also passed first time, which made my experience even better! I passed my test the first time with just 5 minors thanks to John Sundaresan at Drivejohnsons! John is so encouraging no matter what, even when you're having a bad day he helps to lighten your mood so that you still feel confident. I'm so happy to have passed so quickly, see you on the roads! Very very good teacher indeed. Relaxed and friendly. Took the stress out of learning to drive, thank you !.! Couldn't have asked for a better instructor than John! He always made sure that my lessons fit around my college hours and was always happy to pick me up from wherever best suited me. He gave me a progress card at the end of each lesson, so I felt confident with my progress and could set goals for my next lesson! Couldn't recommend John from Drivejohnsons enough! John had such a fantastic knowledge of the Watford area, and there was honestly no questions that he couldn't answer. He explained every manoeuvre in depth and came up with different fun ways that would help me to remember the steps! When entering the Watford test centre car park at the end of the test, get into 1st gear because there's a dip in the road, if in 2nd you will stall. If you can, park as far back into the carpark as possible thus making it easier for returning test candidates. When at the roundabout taking the 2nd exit, turning right onto Stevenson way, get into the middle lane. If on the independent drive using the Sat Nav, and at the Hartspring roundabout it tells you to take the 2nd exit, GET INTO THE MIDDLE LANE and then stick to the left.